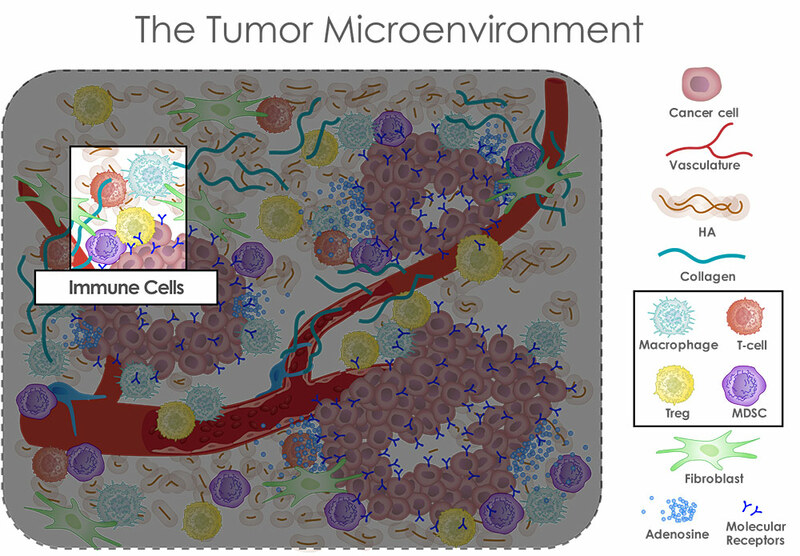 The tumor microenvironment (TME) includes the malignant cancer cells as well as the many non-malignant cells within a tumor (for example fibroblasts and immune cells), blood vessels, and extracellular matrix components, such as collagen and hyaluronan (HA). 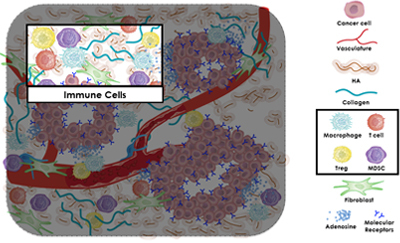 The cancer cells within the tumor can recruit other cell types into the TME and then stimulate them to generate growth factors, signaling molecules and other matrix components that can further optimize the TME for malignant cell growth and result in an immunosuppressive microenvironment. 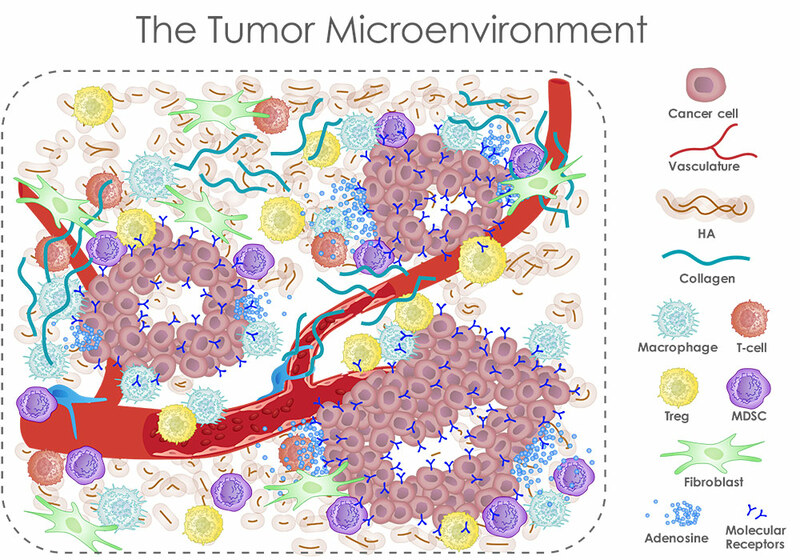 The cancer cell survival can depend on the specialized TME that is assembled for optimal growth and metastasis so perturbation of the TME may lead to a less favorable microenvironment for tumor growth. Decades of investigation have led to the current mechanism-based hypothesis for the role of HA in the TME. Accumulation of HA and associated water within some solid tumors can lead to increased pressure within the tumor microenvironment. The increased pressure can lead to blood vessel compression restricting blood flow, leading to increased areas of hypoxia, and impeding access of therapeutic intervention into the tumor. Hyaluronan (HA) is a megadalton (approximately 1055 Jacobetz et al., Gut 2013, 62:112 to 1077 Thompson et al Mol. Cancer Ther. 9:3052 (2010) Da) polymeric glycosaminoglycan made up of repeating disaccharide subunits of N-acetyl glucosamine and glucuronic acid. It is found in most tissues and body fluids of vertebrates but is most abundant in the extracellular matrix of connective tissues. High concentrations of HA can be found in tissues, such as the skin, umbilical cord, synovial fluid and vitreous humour. HA is rapidly turned over in normal skin with a half-life of less than 2 days but relatively constant levels are maintained by similar rates of synthesis and degradation. 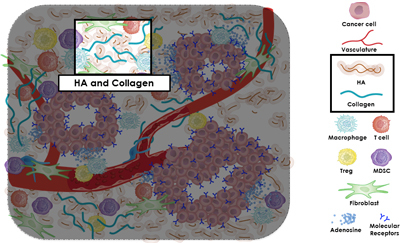 In skin, HA fills the interstitial space within the collagenous matrix and acts as a physical barrier to bulk fluid flow in the subcutaneous space. It does this by binding up to 15 water molecules per disaccharide subunit forming a viscous gel-like fluid. This gel-like HA limits fluid flow in the subcutaneous space, acts as a lubricant in other compartments, such as the synovial fluid within joints, and functions as a viscoelastic cushion to protect tissues and joints. In addition, HA may be involved in various receptor-mediated cell signaling events with proposed roles in areas, such as cell detachment, wound healing, cell migration, inflammation and tumor development. These cancers are sometimes also characterized by robust desmoplastic reactions (increased infiltration of fibroblasts and growth of fibrous tissue in and around the tumor) that result in a fibroblast-rich dense HA-High extracellular matrix within the tumor microenvironment. The HA in the tumor microenvironment binds large amounts of water increasing the volume of the HA gel-like fluid within the tumor leading to increased pressure, blood vessel compression and decreased perfusion. 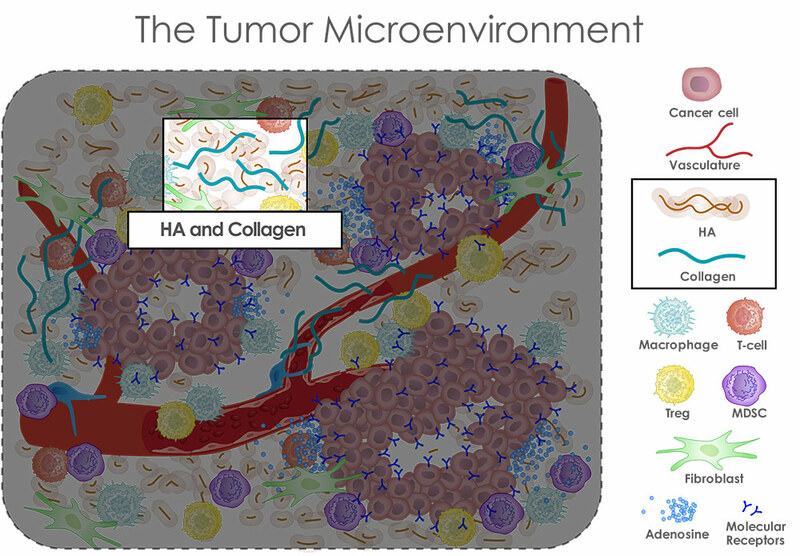 Additional effects of HA accumulation in tumors may include increased areas of hypoxia (low oxygen content) in the tumor microenvironment, decreased immune cell function, and increased resistance to anti-cancer therapies presumably due to decreased drug delivery. HYLENEX® recombinant (hyaluronidase human injection), ENHANZE™ and PEGPH20 are all based on Halozyme’s proprietary recombinant human hyaluronidase enzyme (rHuPH20) that degrades hyaluronan. rHuPH20 catalytically degrades hyaluronan (HA). HA is a megadalton (approximately 1055 Jacobetz et al., Gut 2013, 62:112 to 1077 Thompson et al Mol. Cancer Ther. 9:3052 (2010) Da) polymeric glycosaminoglycan made up of repeating disaccharide subunits of N-acetyl glucosamine and glucuronic acid. It is found in most tissues and body fluids of vertebrates but is abundant in skin and cartilage and within the tumor microenvironment (TME) of some solid tumors. HYLENEX® is FDA approved and it uses rHuPH20 to locally and transiently degrade HA in the subcutaneous space. HYLENEX recombinant is approved to increase the dispersion and absorption of other injected drugs, in subcutaneous fluid administration for achieving hydration, and in subcutaneous urography for improving resorption of radiopaque agents. ENHANZE™ is a drug delivery platform for clinical trials based on the transient and local degradation of HA by rHuPH20 in the subcutaneous space. HA is present at high concentration in the subcutaneous space and acts as a physical barrier to bulk fluid flow by binding up to 15 water molecules per disaccharide subunit to form a viscous gel-like fluid. The gel-like HA limits fluid flow and is the predominant factor that has limited traditional subcutaneous injections to 1-2 mL. ENHANZE temporarily degrades the HA around the injection site allowing large volumes (up to 300-600 mL and beyond) to be delivered in a single subcutaneous injection. Larger volume injections may allow some biologics and small-molecule drugs that are administered intravenously to be delivered subcutaneously potentially providing an improved patient experience by decreasing infusion times or reducing the needs for multiple injections. Halozyme currently has ENHANZE Technology partnerships with Roche, Baxalta, Pfizer, Janssen, AbbVie and Lilly. ENHANZE is not approved as a stand-alone platform. PEGPH20, Halozyme’s investigational product, is a PEGylated version of rHuPH20 that is hypothesized to reduce the high levels of HA (HA-High) that are present in some solid tumors including pancreatic ductal adenocarcinoma, 11 Whatcott et al. Clin Cancer Res. 21:15 (2015) non-small cell lung,22 Pirinen et al. Int J Cancer 95:12 (2001) gastric33 Setala et al. Br J Cancer 79:1133 (1999) and metastatic breast cancers.44 Auvinen et al. Am J Pathol. 156:529 (2000) Overexpression of HA in the tumor microenvironment can lead increased interstitial pressure, blood vessel compression and decreased perfusion that may serve as an important mechanism of treatment resistance.66 DuFort et al. Biophys. J, 110:2106 (2016) PEGylation of the enzyme enables administration via intravenous injection, allowing it to circulate longer in the body where it is thought to help degrade HA in the tumor micro environment. PEGylating rHuPH20 increases the circulating half-life of the enzyme increasing exposure and allowing systemic delivery for oncology indications. Degrading HA in animal models with HA-High tumors led to reduced tumor pressure, increased blood flow and increased tumor growth inhibition activity of some small molecule therapies,77 Thompson et al Mol. Cancer Ther. 9:3052 (2010) immune-oncology antibodies,88 Rosengren et al. (2016). AACR Annual Meeting, Poster #4886 and cell-based therapies.99 Manuel et al. Cancer Immunol Res. 3:1096 (2015) Studies are currently ongoing to determine the efficacy and safety in humans. PEGPH20 has not been approved by the FDA, or any other Health Authority. 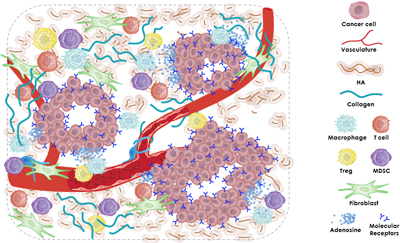 After administration of PEGPH20, the enzyme can accumulate in the tumor reducing the amount of HA and resulting in re-expansion of the blood vessels. These effects can create a TME that is less favorable to tumor cells. In addition, PEGPH20-dependent blood vessel expansion may lead to a tumor that is more accessible to attack by chemotherapies, monoclonal antibodies, and cell-mediated therapies (for example CAR-T and engineered T cell therapies).